We all know about the drawbacks of screen time for young children, but it is hard to dispute the fact that screen time is one of the best babysitters of all, giving mom and dad a short break and a welcome dose of peace and quiet for the least amount of effort. 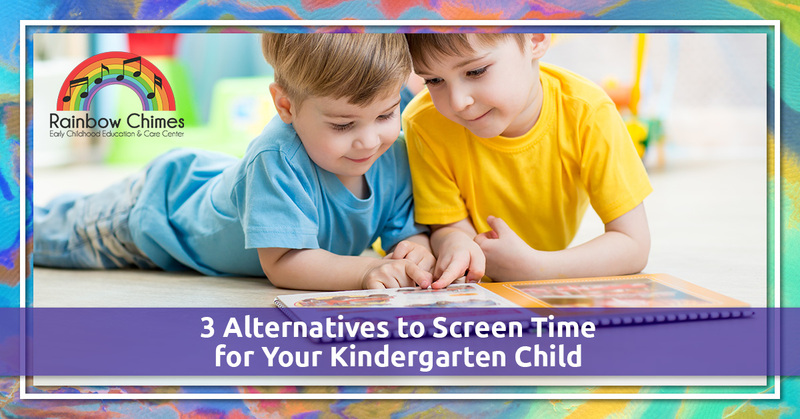 It’s easy to say that you should reduce screen time for your kindergartner, but what’s not so easy is to answer the question, “What’s the alternative?” Many of the alternatives require you to be fully present, and being fully present takes time. But then again, you’ll blink and your child will be grown up, and you’ll wish you had spent more time with them. What could you possibly do better with your time than by giving your young child a few minutes a day where you turn off all the screens, turn your attention to your child, and focus fully on them? It doesn’t have to be all day; even a brief, 30-minute window will benefit your child and deepen your relationship with them. It’s easy to delight kindergarten children with a simple game like hide-and-seek, especially when they know that you are “all in” and not just counting the minutes until you can stop. When you enter into their world, see through their eyes, and throw your whole being into the enjoyment of the game, it’s contagious. You have the power to make it magical, and when you watch your child’s eyes light up, it’ll be contagious right back, filling you with joy that you have brightened their world. Rather than dreading the fact that your child is going to want to repeat this over and over again, take delight in the fact that they think you are an awesome parent, and pat yourself on the back for doing a spectacular job of entertaining them well enough to want to do it again. If you haven’t been reading to your children on a regular basis, it may be tempting to just not bother to try to start. Especially if they are used to the iPad, it can be hard for your four- or five-year-old child to sit still and be engaged in the simple, quiet joy of reading a book. (Something you can try: Go for a week with zero screen time and watch books suddenly become far more engaging to your child.) It’s hard to overstate the importance of reading for your child’s success in every area of life when they grow up, and reading to them while they’re young is a helpful introduction to literacy. Grab a stuffed animal or your child’s favorite toy and begin to invent a story using that character. Act out the story all through the playroom, introducing other characters and props as necessary. Then give your child the main character and say, “You be this one, I’ll be that one,” and choose one of the secondary characters. Watch your child’s imagination take wing as they invent adventures for their character. You can’t always be home with your child. Choose Rainbow Chimes Daycare for all the moments where you need a day care that is nurturing, stimulating, and fun! Contact us today to start the enrollment process.